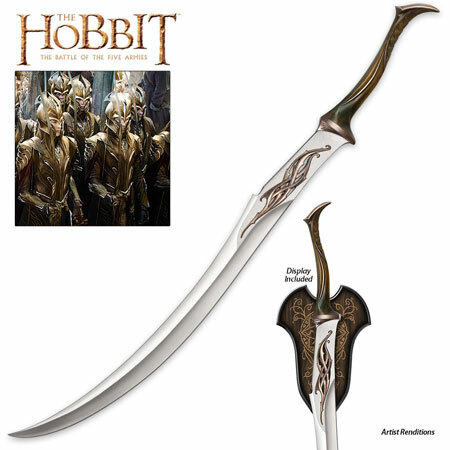 The Hobbit Mirkwood Infantry Swords for sale are 47 3/8th inches in all. The Mirkwood Infantry Swords are officially licensed replicas from the popular Hobbit movie and are meticulously crafted from the real film prop. The 34 5/8th inch blade is made of stainless steel. The Silvan shaped blade is decorated with Elven designs. These swords have a two-handed composite grip and feature cast metal hilt parts that are finished with a bronze-color. They include a Hobbit Movie Certificate of Authenticity and a wooden wall display plaque. They are made by United Cutlery. Buy the Hobbit Mirkwood Infantry Swords for $199.99.